Saint Joachim, whose secular name was John Patrikios, was born in the settlement of Kalyvia in Northern Ithaca, of pious and virtuous parents who were called Angelo and Agnis. When John was a small child, his mother died. His father remarried and his stepmother troubled and tormented him. During these difficult years, John exercised patience and humility, finding refuge in prayer, the solitary Chapel of Saint Spyridon, and in the study of sacred books. In his teenage years he worked as a sailor on his father's boat, and his rare virtues brought him respect and reverence from the crew. However, according to the wish of his malicious stepmother, John removed himself from working for his father and he undertook work aboard the ship of his compatriot, Captain George Vrettos-Hadji. On one of his trips he found refuge at the Garden of the Panagia, the Holy Mountain of Athos. There he became a monk at the Holy Monastery of Vatopaidi, and took the name Joachim. With his asceticism, under the guidance of Holy Elders, he surpassed even the older monks in virtue. With the start of the Greek Revolution, the abbot of Vatopaidi chose Monk Joachim to send him to preach in the Peloponnese. There the Saint tirelessly taught, supported, consoled and encouraged the weary population. Furthermore, with the boat of Papa-John Makris from Kefallonia, the elderly, women and children were transferred from the Morea to the Ionian Islands, saving them from the raids of Ibrahim. In around 1827 Joachim arrived at his small British-held homeland of Ithaca. For forty-one years he tirelessly worked amidst the world, error, heresy and sin. Though there were some Englishmen and native people of Ithaca who revered him, there were others who hated and disliked him due to his holy way of life. His tireless ascetic legs never stopped wandering from one village to another, going into every house, going over every threshold of the small island. His ascetic hands were always open, always giving and not hesitating to beg in order to offer comfort and warmth to the needy and weary. His eyes never stopped shedding tears, his brow never stopped sweating, his fingers did not cease to tighten his prayer rope on behalf of the people of God who suffered under the shadow of spiritual death. During the winter months he was hosted in the homes of pious Christians and in monasteries of the island, while the rest of the year he spent his nights in forests and gorges in prayer. There are instances when the Saint while in prayer, was hovering above the ground and flooded by a heavenly light. He brought suffering to his ascetic body by wearing internal leaden plates tied to his waist, and he would carry big sacks with stones and pebbles from the deserted beaches of the island uphill. He also practiced holy humility beneath the stole of his spiritual father, Hieromonk Agapios of the Holy Monastery of the Archangels in Perachori. He sought to build parish churches and with his sermons reawakened the religious feelings of Ithaca. At the same time, he encouraged the patriots against the dominance of the English, prophesying their bloodless escape from the island. Gifted by the Lord with foresight and clairvoyance, he was a teacher, counselor, nurturer and physician to the people of Ithaca, while he himself lived in great and extreme poverty. 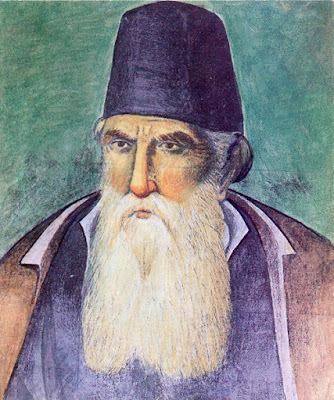 At an advanced age he reposed in the Lord, on 2 March 1868, in the household of Paizi in Vathy of Ithaca. The funeral service of the Saint was chanted in the Church of Saint Nicholas of the city, in the presence of hundreds of disconsolate Christians, who grieved at the loss of their protector. 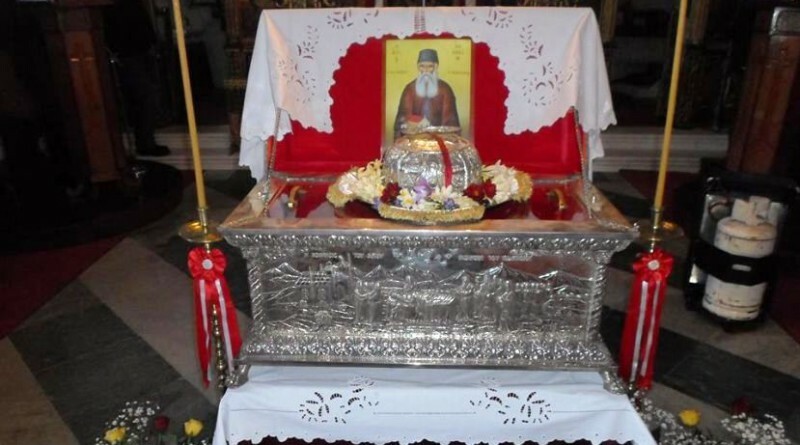 After his body was venerated overnight, the solemn transfer of his holy relics to Stavros took place, which took many hours, and he was buried, according to his wishes, behind the Church of Saint Barbara. During the touching procession to Stavros, his holy relics did not get wet from the rain. With sacred awe countless people who reverently followed saw to their amazement a flock of birds fly over his holy body. These were the first signs of the holiness of the Saint from the Heavens. The living presence and miracles of Saint Joachim continued after his physical death and continue to this day, bringing good to Christians who call upon him with faith. On 23 May 1992 there took place the translation of the Saint's all-revered relics, which are fragrant and wonderworking. In 1998 he was recognized for his holiness by the Ecumenical Patriarchate. Saint Joachim is commemorated on March 2nd, and May 23rd for the translation of his relics. 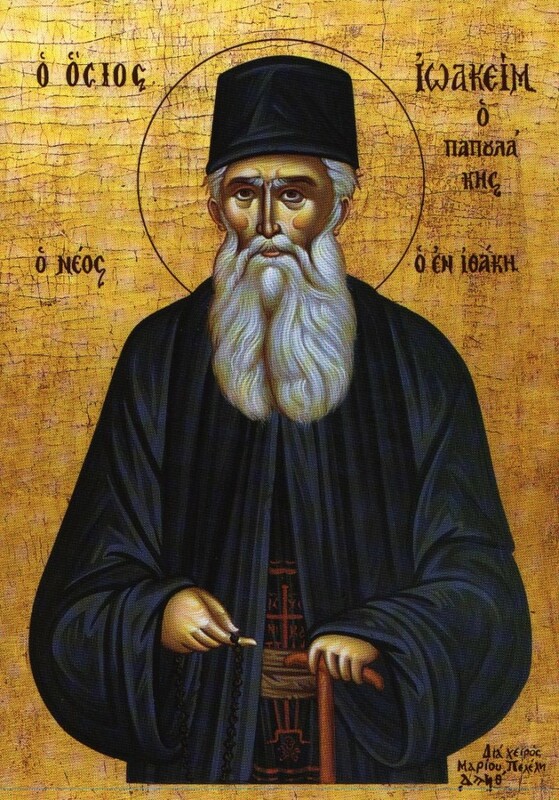 Shining with divine grace, you illumined those caught in the darkness of ignorance and apostasy by your teachings and radiant wonders, Joachim, most-divine ascetic, all-honorable offspring of Ithaca, entreat Christ to grant us the great mercy. 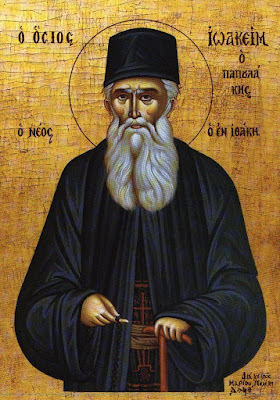 Rejoice, ornament of the monks of Vatopaidi and revered offspring of Ithaca; rejoice, myrrh-container of love for all, godly-minded Joachim, sacred missionary.